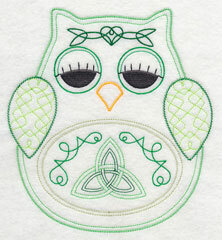 It's a Stitchers Potpourri! 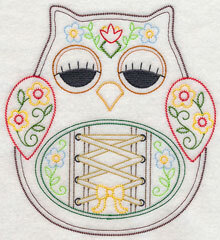 Bring the beauty of embroidery to your next project with a wide variety of new designs! 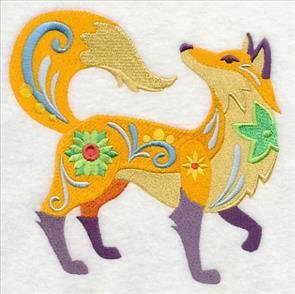 All new designs featuring classic garden motifs and colorful flower power animals are great additions to pillows and quilts. 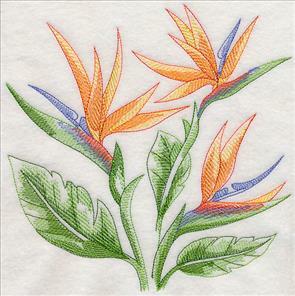 Light and airy sketch-style flowers are terrific on linens and tea towels, plus whimsical firefly designs are wonderful embellishments for updating home decor. 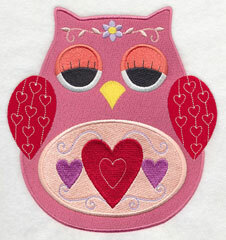 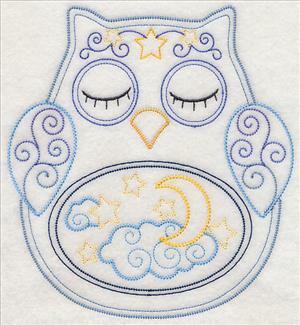 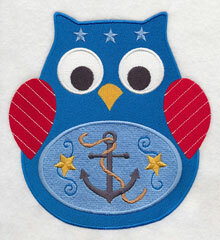 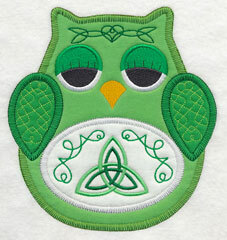 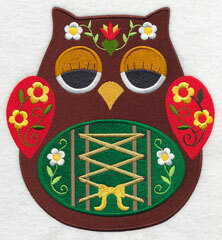 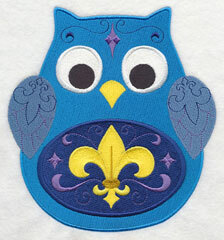 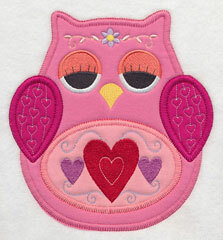 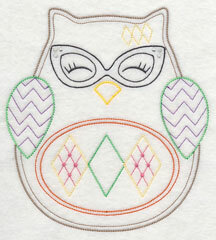 Plus, all new Ohli the Owl designs are too-cute additions to any embroidery project! 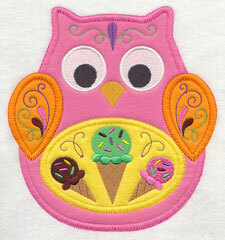 Each design features a clever accent on his tummy (think ice cream cones, teapots, rubber duckies, and more! 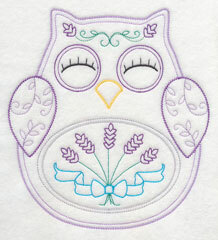 ), and is available in three styles: stitch-filled, vintage, and heirloom applique. 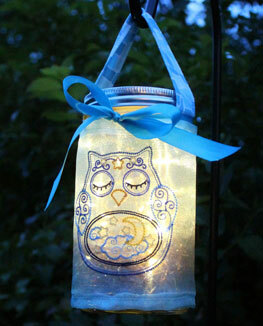 Guarantee sweet dreams with an adorable wrapped Mason jar light. 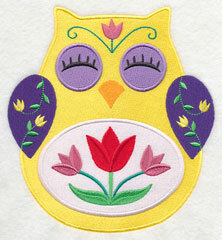 See more of the Ohli the Owl designs right here. 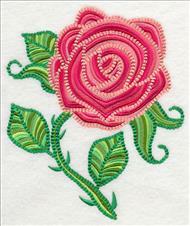 Evoke the wonder and beauty of a garden in bloom with these delicate and intricate designs. 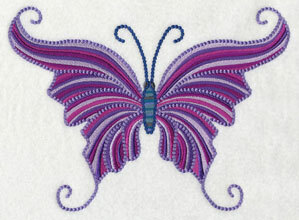 A butterfly and dragonfly are a great way to kickoff this group of stunning outdoor motifs. 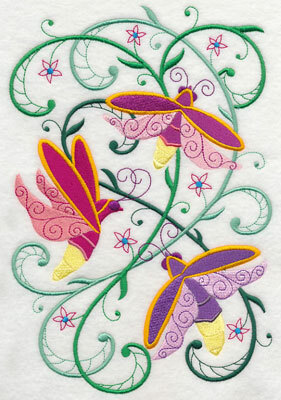 8.84" x 6.90" and 7.49" x 5.86" and 6.22" x 4.87"
Unique stitches and an unexpected use of color give these garden designs a look that's layered with depth and texture. 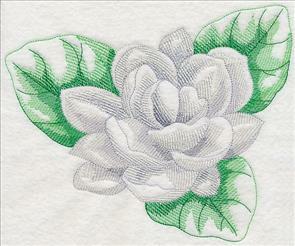 An elegant rose and graceful turtle are impressive additions to garden gear, placemats, pillows, towels, apparel, and so much more! 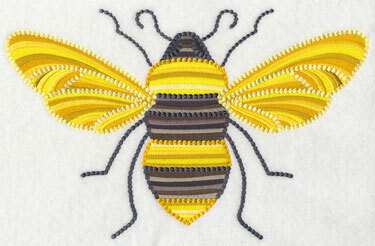 6.90" x 10.76" and 5.86" x 9.13"
5.00" x 7.80" and 4.40" x 6.86"
Let a buzzing bumblebee land on an embroidery project alone, or stitch it with the rest of these eye-catching designs to create a whole set of swoon-worthy projects. 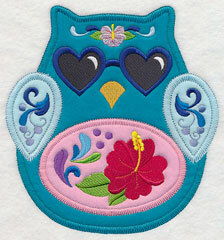 10.76" x 6.88" and 9.15" x 5.85" and 7.78" x 4.98" and 6.85" x 4.38"
Bright, colorful flowers and whimsical swirls and accents give these adorable animals a playful, lively look. 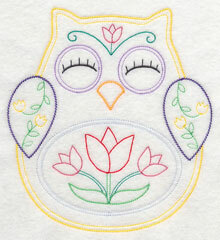 Let them frolic and play across your next embroidery project -- try the fox design on a tote bag or onesie; the owl is fabulous for pillows and aprons. 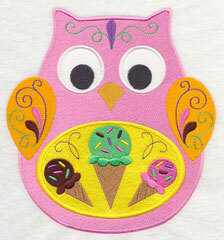 4.71" x 7.45" and 3.70" x 5.85" and 2.45" x 3.88"
The fun style and bright colors in these animal designs makes them perfect for stitching on kids' decor, garden gear, kitchen decor, and so much more. 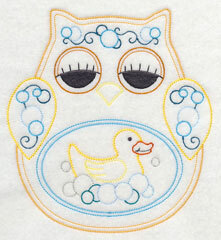 They're terrific on a surprisingly wide variety of projects -- you can even add them to bathroom towels and apparel! 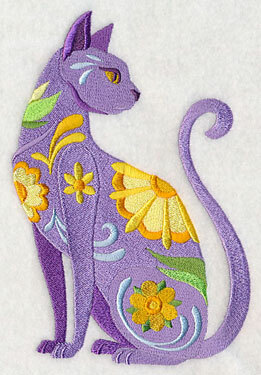 5.15" x 5.19" and 4.58" x 4.62" and 3.84" x 3.86"
Whether you're a cat lover or a dog person, these flowery pals are just the ticket for embellishing tote bags, quilts, pillows, and more. 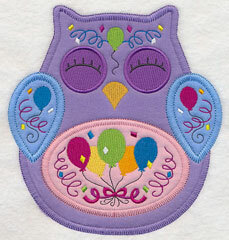 Or, if you're a friend to all furry animals, stitch them both for a fabulous combination! 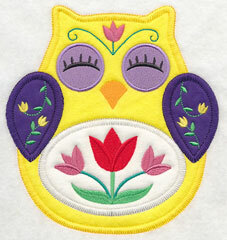 5.87" x 5.85" and 4.86" x 4.85" and 3.87" x 3.85"
Pick your favorite flower power animal, or get the entire collection for one low price! 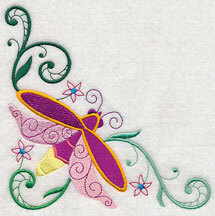 Vibrant and colorful fireflies bring bright energy and whimsy to any embroidery project! 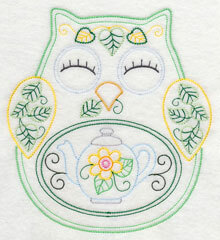 The brilliant designs are perfect for stitching on pillowcases, tea covers, and table linens. 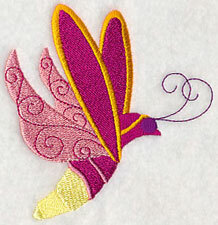 Change the colors in their wings to coordinate with your home decor! 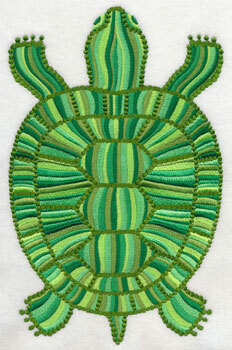 6.85" x 10.07" and 5.87" x 8.63"
6.85" x 10.31" and 5.85" x 8.81"
5.19" x 7.81" and 4.56" x 6.86"
Pair the firefly designs above with a lively border and a corner option. 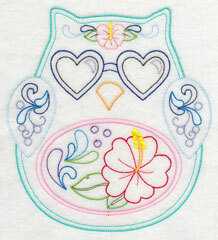 The border is terrific for adorning placemats and tablecloths, while the corner is a fabulous choice for stitching on shirt pockets and napkins. 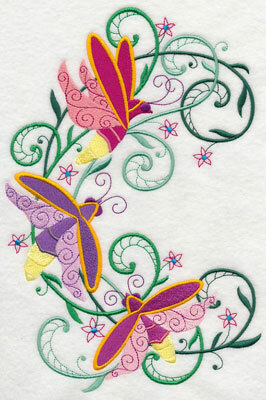 11.75" x 5.43" and 9.42" x 4.36"
5.87" x 5.91" and 4.87" x 4.90"
Finish your collection with two single firefly designs. 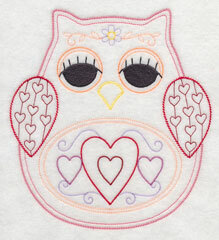 They're great choices when looking for a simple design to stitch! 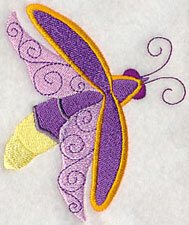 3.22" x 3.85" and 2.09" x 2.50"
The firefly frenzy designs are sold singly; use the links above. 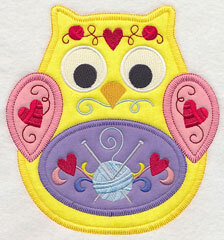 Or, get them all in a design pack! 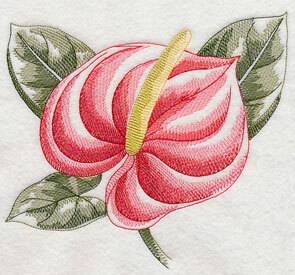 Sketch-style floral designs, like the anthuriums below, are a light and lovely way to add beauty and color to your embroidery projects. 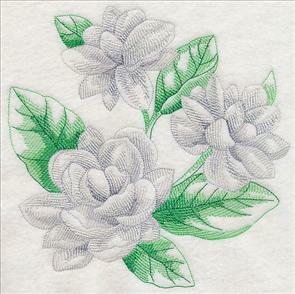 The flowers are especially stunning on tea towels and table linens. 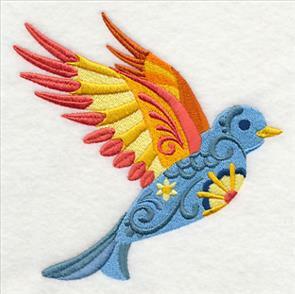 6.18" x 5.85" and 5.12" x 4.85"
Beautiful birds of paradise are a fabulous choice to stitch onto a tote bag, t-shirt, or pillow. 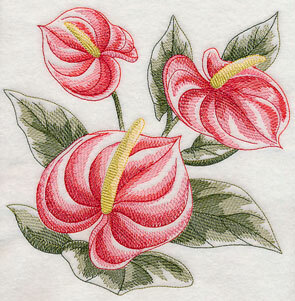 The tropical flower is just as lovely as it is exotic! 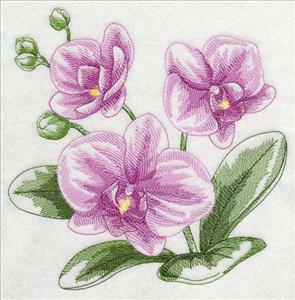 5.82" x 5.84" and 4.84" x 4.86"
6.98" x 7.80" and 6.50" x 7.26"
5.85" x 6.53" and 4.85" x 5.42"
Phalaenopsis, also known as the Moth Orchid, is a beautiful blooming flower -- and is a delightful addition to a wide variety of embroidery projects! 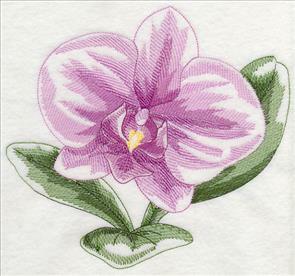 Try these gorgeous Phalaenopsis designs on pillows, aprons, placemats, quilts, and so much more. 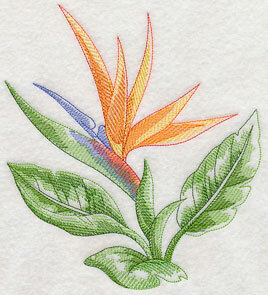 7.78" x 7.22" and 7.00" x 6.50"
Jasmine is well known for it's unique scent and taste, and is commonly used in teas, syrups, perfumes, and bath products. 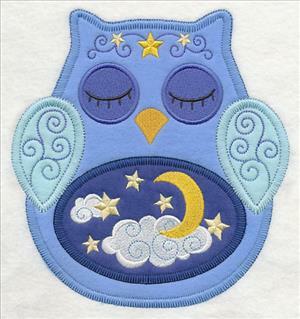 But did you know it's absolutely beautiful, too? 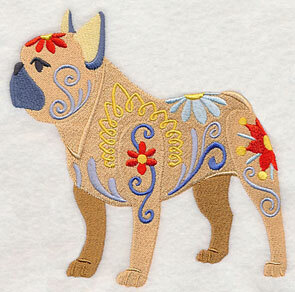 Stitch the stunning flower on your next embroidery project! 7.79" x 7.78" and 6.89" x 6.88"
8.13" x 6.88" and 7.46" x 6.31"
6.91" x 5.84" and 5.74" x 4.85"
The immensely creative woman behind Sew Jenaissance is super talented, oh-so-crafty, and a total pro when it comes to sewing and embroidering. 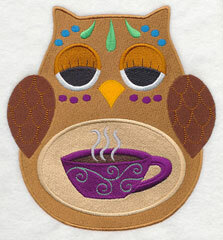 That's why we are excited to collaborate with her again on her adorable creation, Ohli the Owl! 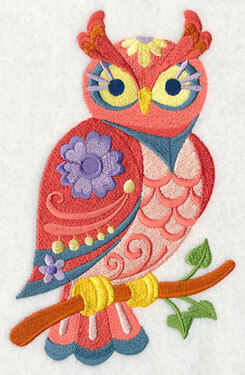 We thought the sweet owl would be excellent for machine embroidery -- and now he's available in three different styles. 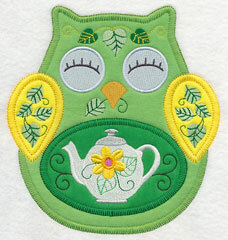 Pick your favorite from stitch-filled, vintage, and heirloom applique designs. 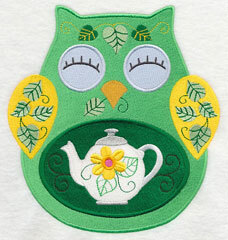 Each of the designs comes with a special accent on his tummy, like the elegant teapot below. 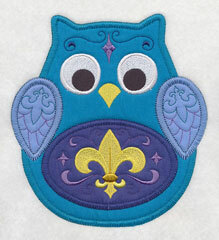 6.88" x 7.34" and 5.88" x 6.28"
6.88" x 7.51" and 5.88" x 6.42"
6.84" x 7.31" and 5.85" x 6.25"
4.83" x 5.16" and 3.63" x 3.87"
Satisfy your sweet tooth (and Ohli's, too!) 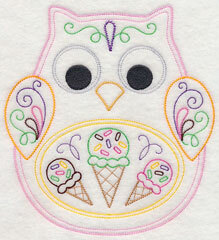 with a trio of scrumptious ice cream cones! 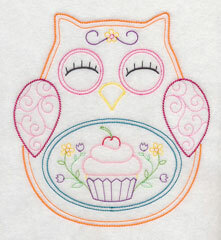 They're the perfect way to sweeten up dish towels, aprons, oven mitts, and more kitchen decor. 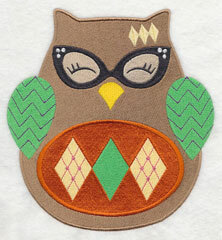 Slap on your sunglasses and head to the beach with this sunny design! 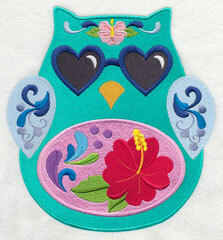 Ohli the Owl is ready for a tropical vacation with his hibiscus tummy and heart-shaped shades. Stitch him on beach towels, tote bags, swim cover-ups, and more! 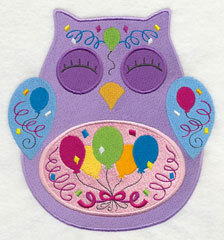 Whoooo's ready to party? 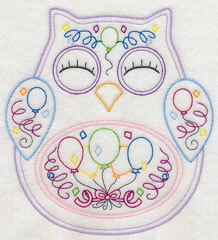 Whether you're celebrating a birthday or any other festive jubilee, this Ohli the Owl design is ready for any bash! 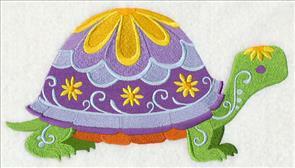 Add him to decorations, gift wrap, and more. Knitters, unite! Share your love of the cozy craft with an Ohli the Owl design featuring knitting needles and yarn on his tummy. Perfect for craft bags, pillows, and framed pieces! 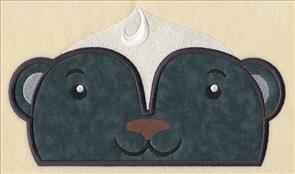 6.89" x 7.51" and 5.90" x 6.43"
Corral your crocheting supplies with a tote bag that's perfect for carrying yarn, needles and patterns. 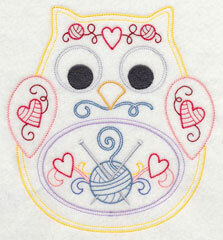 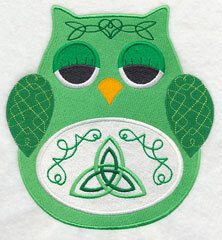 Or, try this crocheter's Ohli the Owl design on gifts for your crafting groups, art for your sewing room, or apparel! 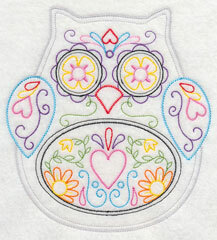 6.89" x 7.35" and 5.88" x 6.28"
This Ohli the Owl design is ready to take a trip to Germany to celebrate Oktoberfest, the Bavarian festival held in Munich every October. 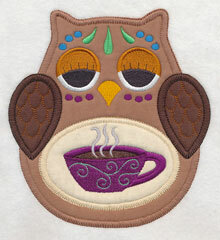 Stitch him on shirts, bags, and towels! 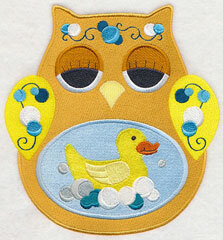 Ohli and his little rubber ducky are ready for bath time in this adorable design! 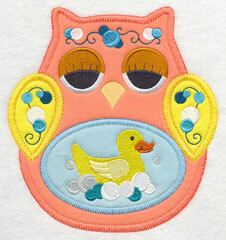 Stitch the sudsy owl on bath towels, robes, and other bathroom decor. 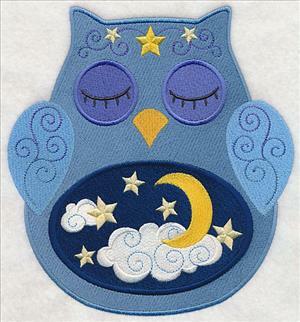 Gear up for a good night's sleep with a sweet dreams Ohli the Owl. 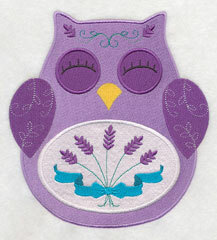 He's ready to hit the hay -- and is a great addition to blankets, pillows, and other bedroom decor. 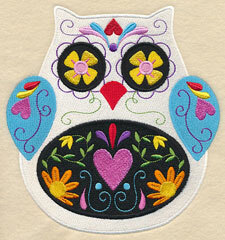 Ohli the Owl gets a makeover worthy of Dia de Los Muertos, or the Day of the Dead. 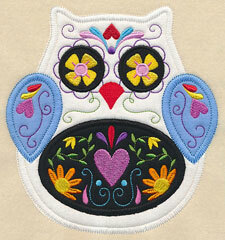 Sugar skull accents make this design a magnificent addition to totes, pillows, sweatshirts, and more! 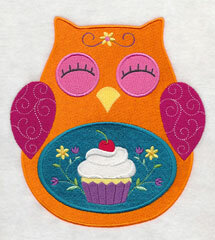 We had a wonderful time collaborating with Sew Jenaissance to create these designs. 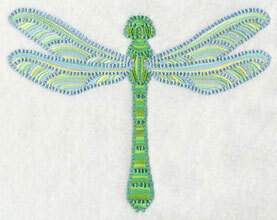 If you'd like to see more of her work, visit her Etsy store here. 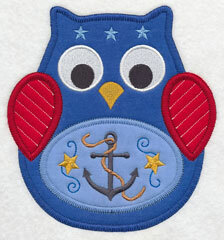 **XL - All smaller than 7.9" x 7.9"
**Lg - All smaller than 6" x 10"
**Md - All smaller than 5" x 7"
**Sm - All smaller than 4" x 4"
Love how cute and friendly Ohli is? 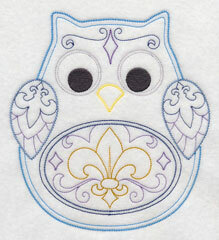 Check out these designs from our previous collaboration with Sew Jenaissance! 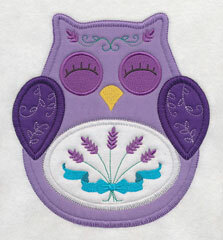 They're also all available in stitch-filled, vintage, and heirloom applique styles. 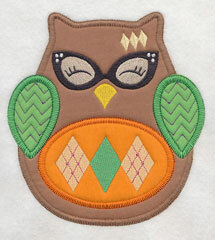 6.87" x 7.34" and 5.87" x 6.28"
4.85" x 5.19" and 3.64" x 3.90"
6.88" x 7.51" and 5.88" x 6.41"
4.90" x 5.34" and 3.56" x 3.88"
6.84" x 7.31" and 5.85" x 6.24"
4.83" x 5.16" and 3.63" x 3.88"
6.90" x 7.52" and 5.88" x 6.42"
6.84" x 7.30" and 5.85" x 6.24"
6.89" x 7.51" and 5.89" x 6.43"
6.90" x 7.52" and 5.86" x 6.40"
6.91" x 7.54" and 5.90" x 6.44"
6.90" x 7.53" and 5.88" x 6.42"
6.88" x 7.56" and 5.88" x 6.46"
6.90" x 7.53" and 5.87" x 6.41"
6.90" x 7.52" and 5.89" x 6.42"
Animals on the Edge are great additions to the bottom of towels, blankets, bibs, and more! 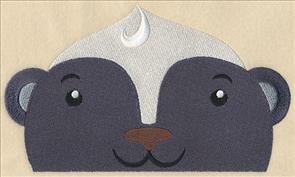 Natalie was hoping we'd create a version featuring an adorable skunk, and we loved that idea! 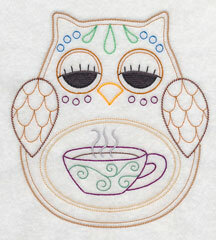 Get the tutorials for stitching both versions: a stitch-filled design and an applique version. 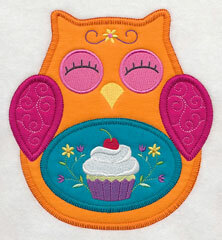 Thanks, Natalie! 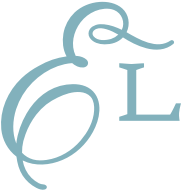 8.52" x 4.99" and 6.88" x 4.03" and 3.90" x 2.28"